In a small saucepan, combine Pesto Seasoning Mix, olive oil and ½ cup water. Bring to a boil over medium-high heat, stirring constantly. Once boiling, remove from heat and stir in balsamic vinegar. Set aside. Place chicken on a cutting board and cut a pocket about three quarters of the way through on the thickest side of each breast, taking care not to cut all the way through. In a small bowl, combine oregano, basil, garlic powder, salt, pepper and 1 tablespoon olive oil. Rub over chicken and into the cavity. 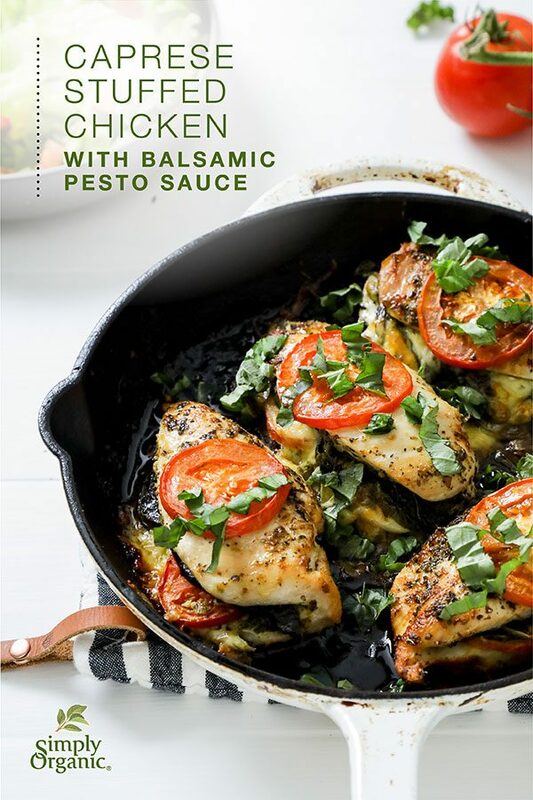 Fill each chicken breast with one slice of fresh tomato, one tablespoon pesto sauce, one slice of cheese and three basil leaves. Seal each pocket with three or four toothpicks placed diagonally to keep the filling inside while cooking. In a cast iron skillet, sear chicken breasts for two to three minutes per side. Pour remaining pesto sauce over chicken and top with an additional tomato slice. Transfer pan to preheated oven and bake for an additional 15 to 20 minutes, or until chicken is cooked through and cheese has melted. If desired, turn oven to broil for two to three minutes to char the tomatoes. Remove toothpicks and serve. Add 1/4 cup chopped spinach to each breast pocket for additional nutritional boost.